Jonas Brothers Fandemonium: JONAS Premieres TONIGHT!!!! 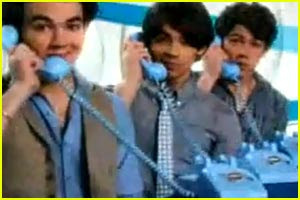 The Jonas Brothers call up their best friends in the credits for their new series, JONAS. Nick, Joe and Kevin will debut their show TOMORROW, May 2 @ 8PM ET/PT on Disney Channel. Also, be sure to check out the JoBros and costar Chelsea Staub on Radio Disney tomorrow morning as they host the Top 30 Countdown. It all starts @ 7AM PT/10AM ET. TELL JJJ: What do you think of the opening credits?